I wanted to provide a page that lists all of the big wins I’ve had over the years. 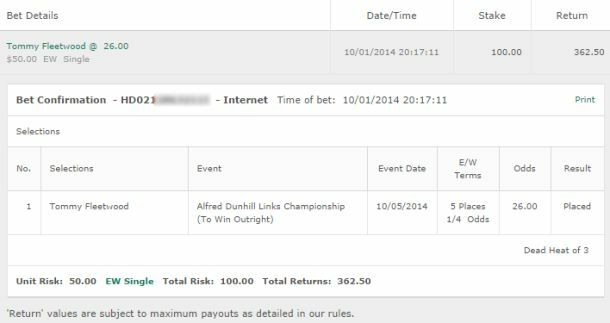 These are screenshots of all the betting slips showing my big wins – basically the golf betting tips hall of fame. Maybe at some point I’ll get all super fancy and create an interactive spreadsheet listing all the bets and allowing you to filter it all and so on – but for now, just enjoy the screenshots. I started providing golf tips online at the end of 2014 and we list 2014-2016 here. I will list 2017 once the year is over with. For now you can see those wins in the right sidebar.